Laptops are going everywhere that our laps are going. Many people have scrapped the idea of a desktop computer to rely 100% on their laptop computer. All of their pictures, music, emails, as well as their gateway to the virtual world lies in those 6lbs of battery operated, LCD screen goodness. This is why it’s important to carry around your $2000.00 investment not only in safety, but also in style. I have decided to test multiple laptop carrying devices in order to find the perfect fit for the perfect moment. This is the first of many laptop case reviews. 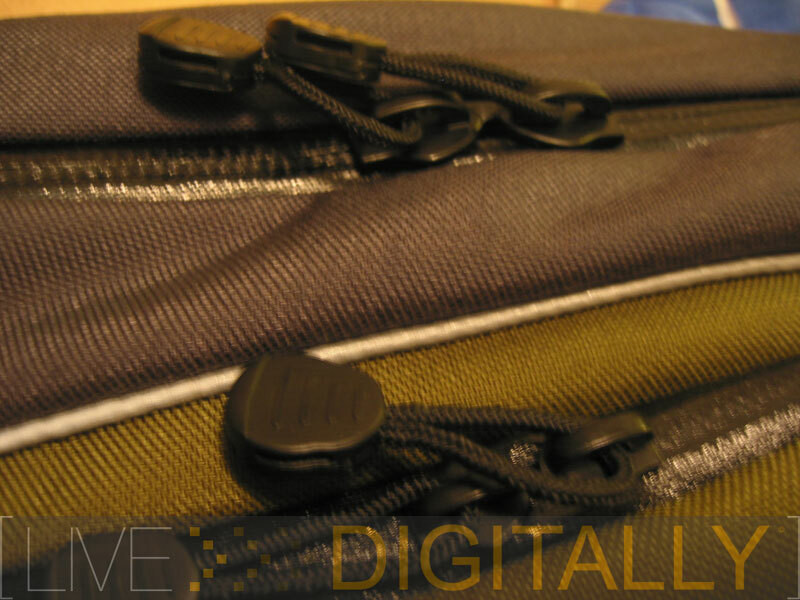 Each item tested will be subject to a laptop case obstacle course (The LIVEdigitally Laptop Case Obstacle Course). This test will push laptop case manufacturers to their full potential forcing their positives to shine through, and allowing their faults to be exposed. 1.) Capacity Test: Can the case hold everything needed for a trip with my laptop? 2.) One Hour Endurance Test: I will load the case with all my necessary items, and wear it for one hour. How do I feel after that hour? 3.) Water Test: Loaded with dry cardboard, I will douse the bag with water to simulate a rainy environment. Is the cardboard wet afterwards? 4.) Function vs. Style Test: Does this case suit both needs of looking cool while getting the job done. The first bag to catch my eye was Tom Bihn’s Buzz bag. I’m a sling type bag virgin, and this is the one I chose to give it up to. 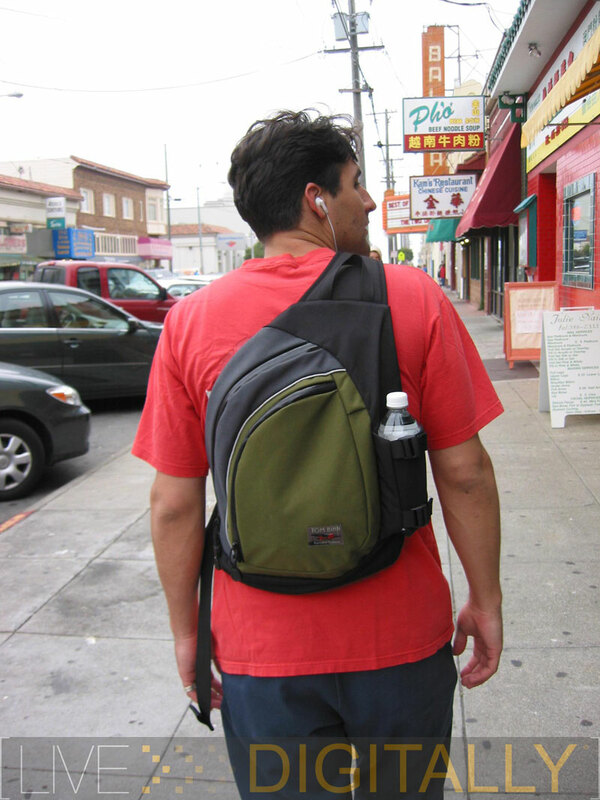 Tom Bihn is a Seattle based company and caters to Apple products, but is not monogamous. Their bags are American made, and sold in Canada as well, which is why their tag is written in English and French. I noticed that there are a few more words written in French on the tag than English, but I don’t know French? The first thing I noticed about the Buzz was evidently, the zipper. That’s right, I looked at the zipper in bewilderment, which soon turned to astonishment. There is a plastic skin that covers the zipper teeth. This plastic liner not only helps in preventing the teeth from catching on something and jamming the zipper, it also keeps water out of the bag (so I assumed, and later will test). The canvas-like material is thick, and of high quality. 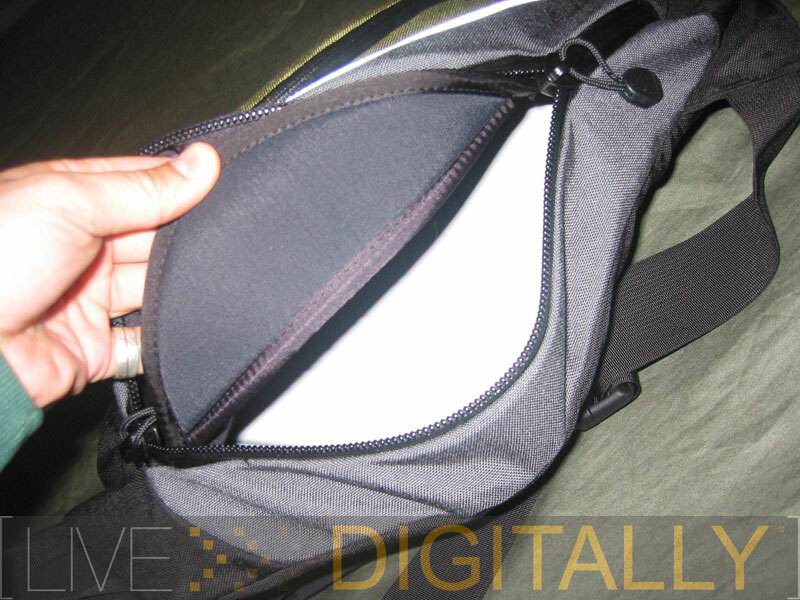 The bottle holder has an elastic section as well as two tightening straps. I did notice that the water bottle holder was a tad small, and neither of my 32oz Nalgene bottles would fit, a major bummer for yours truly. Opening the front compartment unveiled some different storage compartments including a keychain holder (must for any bag). 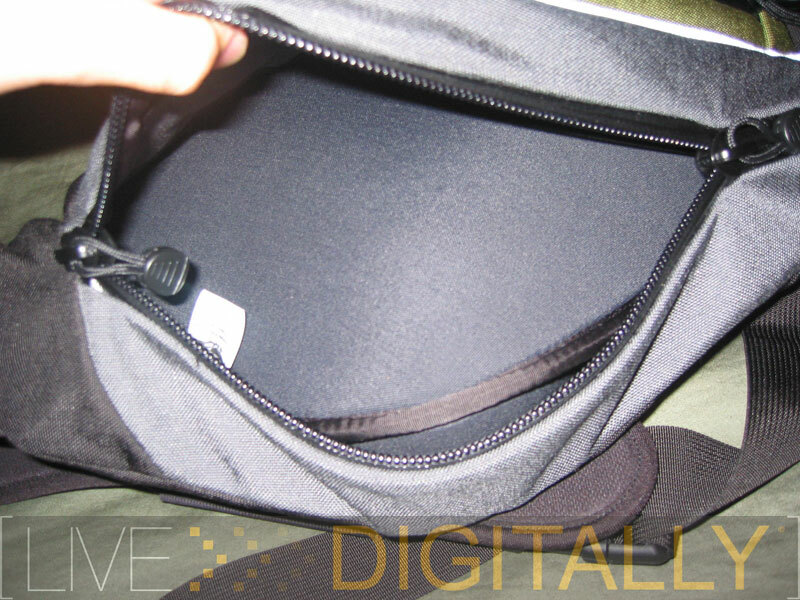 Moving on, I unzipped the big zipper and found a laptop sized padded sheath affixed in the bag. This turned into my new favorite feature. The padded sheath was securely fastened to the bag, and allowed for Rebecca to be safe from shock as well as an accidental ejection. Rebecca is the name of my iBook by the way, I figure that anything I spend minimum of four hours a day with, deserves a real name. This goes to show how much I care about my laptop, thus my need for a perfect carrying case. The next and final pocket of the Buzz is on the strap. The Velcro flapped ‘iPod pocket’. 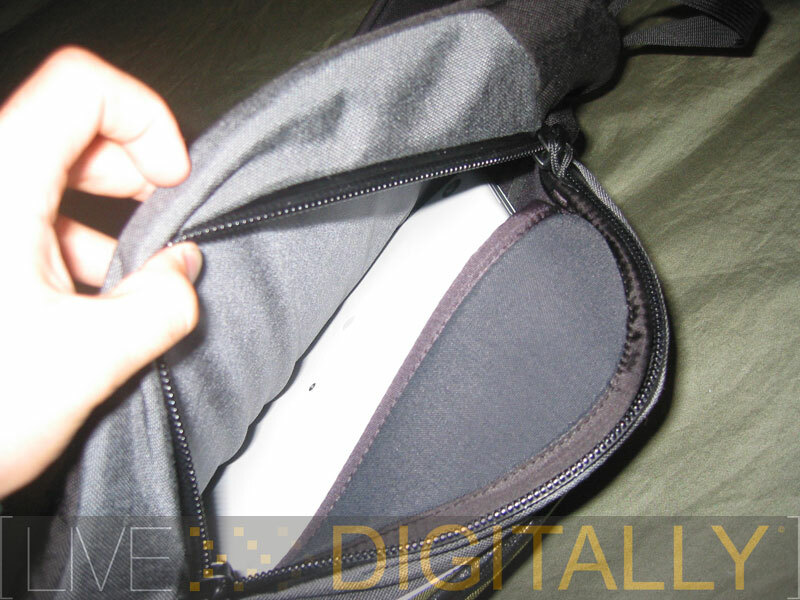 Although Tom Bihn doesn’t exclusively say it’s an iPod pocket, an iPod fits perfectly. I didn’t like this. My iPod doesn’t go anywhere naked, the DLO Jam Jacket my iPod wears might as well be permanently secured to her exterior. An iPod case makes my iPod just a tad too big to fit in the ‘iPod pocket’ nicely (it still fits however). This is not a Tom Bihn problem exclusively, I see this issue across the board of all bag manufacturers. In a perfect world all bags will have pockets that fit iPods with cases on them, only in a perfect world. 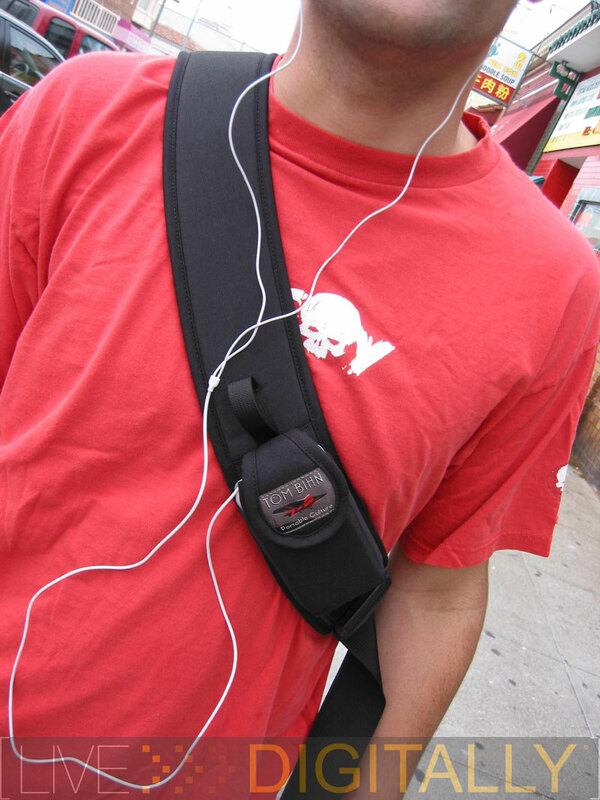 Tom Bihn did incorporate a breakaway clip on the sling strap, below the ‘iPod pocket’, which I found to be imperative. I could tighten the bag to my preference yet disconnect quickly. Without this clip I would be constantly squirming in and out of the sling strap. I took the bag to and from work each day for a solid week. After work I’d walk to local coffee shops with the bag. Each person I met with looked at the bag and tried it on. The females seemed to like how I looked with it, and the males seemed to like how it fit and felt. None of the girls I showed the bag to liked wearing it. “The strap is just too wide”, they said. Girls with larger cup sizes did not find the sling strap comfortable, hence I dubbed this bag, men only. I drink the recommended 64oz of water each day, with the help of my 32oz Nalgene bottle collection. Where I go, my Nalgene bottle goes, and this bag just couldn’t fit it. None of the bags I reviewed even had a bottle holder, so the feature is a plus, but I wanted it to be just a tad bigger. The tote handle at the top was initially scrawny for my liking. 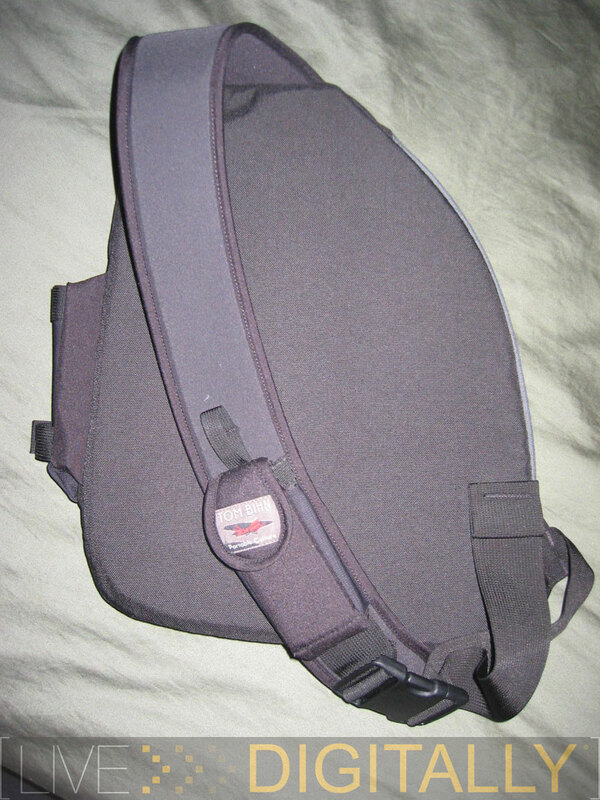 The breakaway strap allowed for easy on and off access, but this was all made possible by the small tote handle up top. I wanted the handle to use some padding at first, but after a rethink, felt it was sufficient for quick on and offs. The sling strap could have had a bit more padding however, which could allow for a thinner, more female friendly, breast strap. The style initially attracted me to the case, subtle earth tones feel nice. 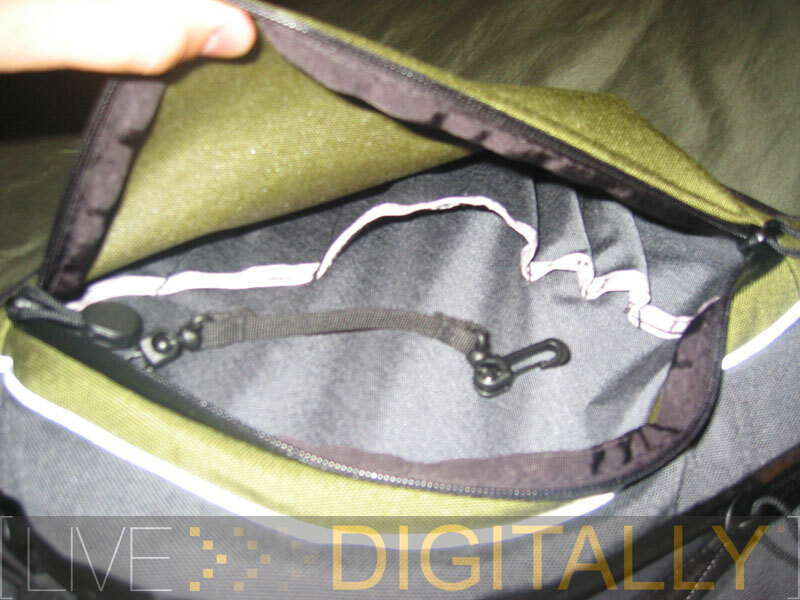 Quality screams out with this bag, from the zippers to the cloth, this won’t fall apart even when I use it. The sewn in sleeve laptop holder swept me off my feet. I can open the bag while inverted and Rebecca will not fall out, or even come close to doing so. The fact that there is a water bottle holder is awesome, I wanted it to be bigger, but then that may add too much weight. The padding between the laptop and my back makes for a comfy situation while I’m on the go. I could wear this bag for extended periods of time, with minimal discomfort. I’m agile with this bag, and feel that my baby (iBook) is secure. Running for the bus is not a problem with Tom on my back. 1.) The Capacity Test: This bag did well with the capacity. I would have liked a bit more storage, but that would have ruined the design and agility of the bag. 2.) One Hour Endurance Test: Passed with flying colors. 3.) The Water Test: Rubber zipper coverings proved to hold up to their expectation, the cardboard was dry as a bone after being doused with some H2O. 4.) The Function vs. Style Test: This bag carried all that I needed comfortably and in style. 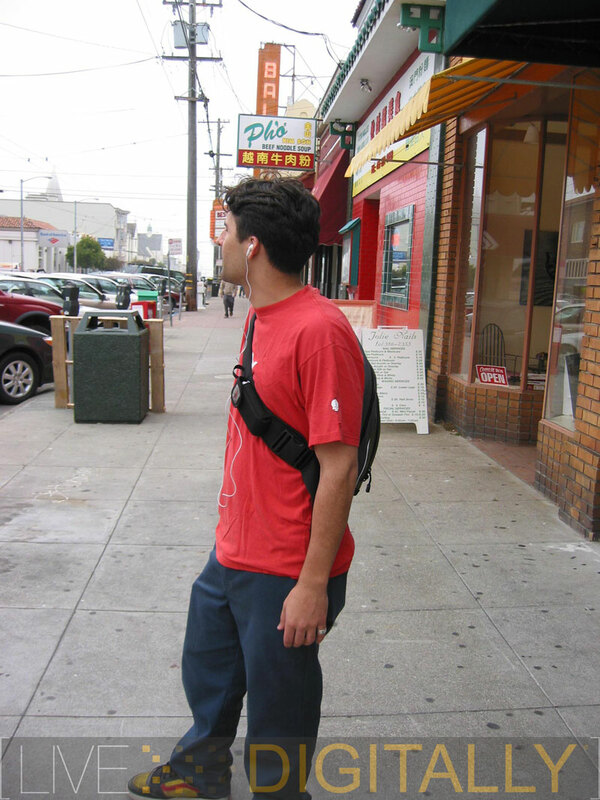 Tom Bihn rides the teeter-totter quite well on the balance between function and style. 5.) The Female Test: Three out of three females gave me the go ahead to wear this bag in public. They said it looked good and I looked good in it. I did not, however, get any phone digits because of the bag. Good thing getting cute girl phone digits isn’t part of the Laptop Case Obstacle Course. what are the other colors? red? blue? work with me here, i need colors..
yo, nice shirt. cool article as well, very scientific according to this MIT scientist. The liners in Bihn bag are good enough to soak up liquid before it penetrates through to other items inside the bag. I know this from frequent field testing of loosely capped fizzy drinks.